Mike Benny has been illustrating for more than 15 years. His clients include Greenwillow/HarperCollins, Random House, Scholastic, and Simon & Schuster. 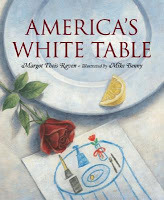 His books include America’s White Table, written by Margot Theis Raven (Sleeping Bear, 2005), The Listeners, written by Gloria Whelan (Sleeping Bear, 2009), and Oh, Brother! written by Nikki Grimes (Greenwillow, 2007). Mike has received two gold and two silver medals from the Society of Illustrators, and he makes his home in Austin, Texas. 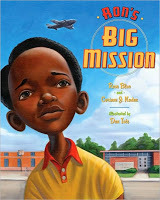 Don: How did you snag your first children’s book, and what advice would you give to aspiring picture book artists? Mike: My first book began when an art director at Sleeping Bear Press was searching for war-related images at an illustration directory site. 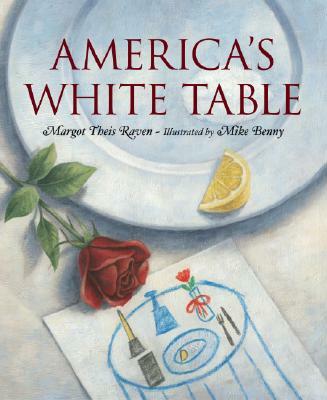 I had one illustration of a soldier that piqued their interest, and that one image led to my illustrating the book America’s White Table [Margot Theis Raven] (2005). For artists looking to break in, I would stress consistency as the most important element of a portfolio. Find one style or technique that represents what you do best. There will be time to work on other styles when you are more established in the field. Don: What kind of training prepared you for your career as a children’s book illustrator? Mike: For me, it was becoming a father. I was offered a few books before I was married and had children. I tried to make a go of it, but for many reasons, I just was not ready and I had to give up on those projects. Don: Your clientele is diverse. You’ve created art for Rolling Stone, GQ magazine and the New Yorker. How do you promote yourself, what are you doing to keep your name and artwork before the eyes of editors and art directors? Mike: I’ve never been a great promoter of my work. For my editorial work, I have relied on a casual variety of illustration directories, portfolio websites, and illustration annuals. Not a sure-fire recipe for success. I’m still figuring out what to do in the children’s market. I was hoping that once I was published, manuscripts would come pouring in. That might happen for some, but not for me. When I do send samples or postcards out, I make sure to only send my best work and images that represent the type of work I would like to do. I think the key is to remind, remind, remind, just to the point of being a pest and then pull back. Don: I’m a fan of your book The Listeners [by Gloria Whelan (Sleeping Bear, 2009)]. It’s truly beautifully illustrated. What we’re some of the challenges you faced in bringing this story to life? Mike: Thanks, I did have challenges, and I might have made them bigger than necessary. The story did not specify a location or setting, so I had to determine from the smallest details what state and region it could have taken place in. Once I resolved that, finding the right architecture, clothing, cotton plants and farm equipment became a research challenge. I’m sure that the details would not have been important to many, but I felt compelled to be as accurate as possible. Don: Who are the people depicted in your work? Hired models, people from memory? Mike: I have not used models yet in my work. I usually use a combination of found photos and some of my own poses. I’m resistant to using models because I’m afraid I would be too locked in to their pose or expression. I’ve tried using my wife and children for models, but the success of that venture is directly related to their enthusiasm. Most of the time, they are not too enthusiastic. Don: When I first got into this business some 20 years ago, many editors preferred, and would seek out African American artists for manuscripts dealing with African American subject matter — especially slavery, reasoning that Blacks could bring a certain level of sensitivity to the subject matter that whites couldn’t. Did you have any reservations, challenges, fears about approaching the subject matter? Mike: I did have concerns before I took on this project. I was concerned that there were too many books about slavery already. I was worried about what I could bring to the table that has not already been delivered. I was worried about a Caucasian author and illustrator working on a book about slavery. I had no easy answer to these concerns. It boiled down to the story being too beautiful and interesting for me to pass up. I gave it my best effort, and all I can hope for is that it shines through. Don: Your book Oh, Brother! 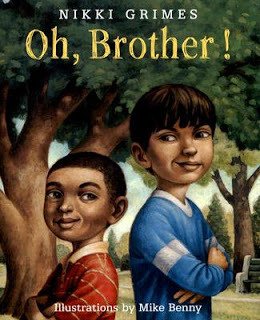 [by Nikki Grimes (Greenwillow, 2007)] features two brothers, Black and Hispanic. 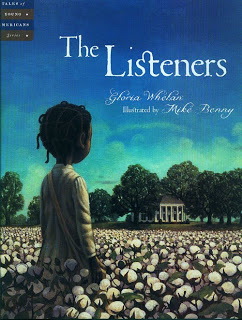 The main characters in The Listeners are Black slave children. The images on your website reflect true diversity of culture, race, topics. Talk about what goes into accurately portraying race and ethnic groups different from your own. Mike: I think I take on each project the same way, I try to relate to the characters the best I can. Over the years, I have become more comfortable taking on projects with different character ethnicities. I always try to do as much research as possible for the subject given. Don: A few years ago, you and I chatted about the WPA Federal Art Project and artists like Thomas Hart Benton and others. How have these artists and their works influenced you? Mike: I think this art era is intriguing because the art was intended for the masses. I have especially enjoyed reading about the artists and the art of post office murals. For many people, this was their first experience seeing art in person. People could relate to this type of art, and they also discovered they could have opinions about it. In many ways, this is what our children are experiencing with picture books. Don: I recently discovered some of your work in a 1994 Society of Illustrators Annual. You’ve been doing this for awhile. What is the most important thing you’ve learned about illustrating children’s literature over the course of your career? What are the biggest changes you’ve witnessed? Mike: I have been illustrating for 20 years, and the biggest change for me is the level of talent that is out there. I believe the young and focused artists are better than ever. They come out of art school knowing they want to be children’s book illustrators, where you and I were just trying to keep our heads above water those first years. Learning as we go in the school of hard knocks. Don: Some of my favorites in your portfolio are the old-time-y baseball themes, some of which have won medals in the Society of Illustrators. Where did this come from? Are you a baseball aficionado? Mike: I’ve always enjoyed creating baseball images, mostly from the early years of the game. I played baseball into college, and I still play today in adult leagues, but I would not call myself an aficionado. The Josh Gibson piece was memorable for me also because it was one of the few times I was able to recreate what was in my head onto paper. He was, in my opinion, the best player ever and certainly the most powerful, and for some reason it all clicked into place for me. Don: What can your fans, like me, look forward to seeing from you down the line? Mike: Right now, I am working on a baseball story set in the ’40s. I would also like to try my hand at writing my own books. So far, the books I’ve been given to illustrate have dealt with more heavy themes. I would really like to tap into my goofy and wacky side. I’ve got some ideas, but now I have to get down to writing them. From his official website: “Don Tate is the award-winning illustrator/author of more than 25 trade and educational books for children. With a bold, dynamic style, Don’s oil and acrylic paintings bring to life the pages of the children’s books he illustrates. Don’s books include: Ron’s Big Mission, written by Rose Blue and Corinne Naden (Dutton, 2009); I Am My Grandpa’s Enkelin, written by Walter Wangerin Jr. (Paraclete Press, 2007); and Sure as Sunrise: Stories of Bruh Rabbit and his Walkin’ Talkin’ Friends, written by Alice McGill (Houghton Mifflin, 2004). He makes his home in Austin, Texas.